All you need to do is read three paranormals with a romantic theme between 1st April and 30th June 2009. 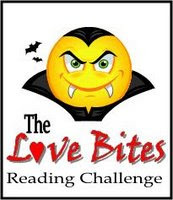 This challenge is hosted by Royal Reviews, and there are some other great buttons available too, incuding a couple of Bill and Sookie from True Blood and Edward and Bella from Twilight. That is a cute button. :-) Good luck with the challenge, Marg!